Many people had warned us and said it was too dangerous to enter Afghanistan, but we knew that if we would not go into a country where we were recruiting people to serve, we had no right to recruit them. Steve Goode and Marie Bentley, high-school sweethearts from Tennessee, couldn't have imagined all they would see through multiple decades of service to the poor and oppressed. Never shying away from God's call, they have served in refugee camps and war zones and lived through personal illnesses and struggles. 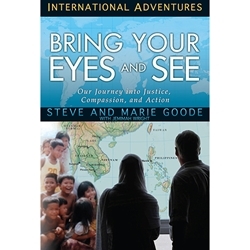 As long-term leaders of Youth With A Mission's mercy ministries and efforts against human trafficking in Southeast Asia and beyond, Steve and Marie have brought healing and hope to thousands of people and continue to inspire others to do the same. "The path that the Goodes take us down in this book is exhilarating. Their practical blend of justice and spirituality propel them to Afghanistan, Thailand, India, Africa, and a thousand destinations in-between. Readers better prepare to have their hearts broken and their spirits lifted at the same time."